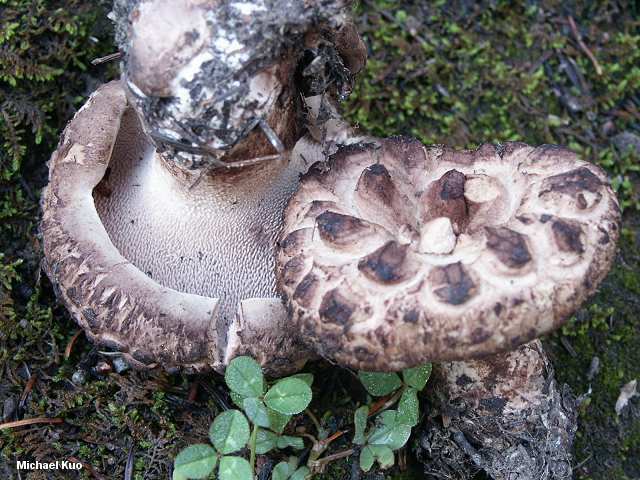 Sarcodon imbricatus is an impressive, widely distributed toothed mushroom, fairly easily recognized by its large size, its conspicuously scaly brown cap, and the absence of greenish stains on the stem base (if your identification interest is more than casual, you may want to verify the presence of clamp connections under the microscope). 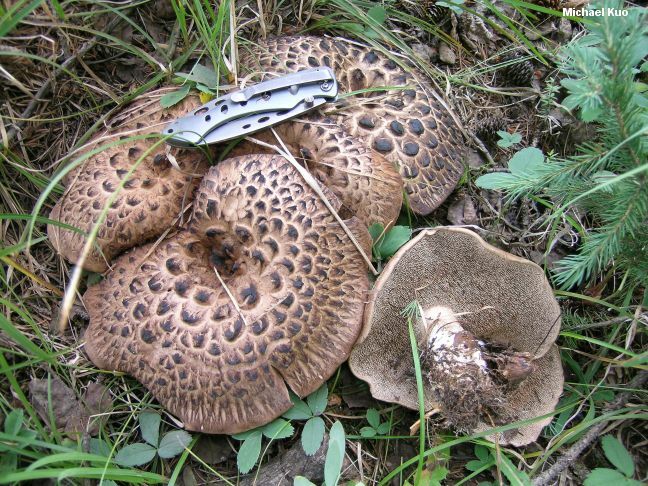 Though it is found across North America, Sarcodon imbricatus is especially common in the Rocky Mountains, where it grows under Engelmann spruce and subalpine fir during monsoon season and can attain astounding sizes (caps up to 25 or 30 cm across). DNA analysis in Europe (Johannesson and collaborators, 1999) has supported the idea that Sarcodon imbricatus is an obligate mycorrhizal partner with spruces, while the similar Sarcodon squamosus associates with pines; the authors believe the two taxa have been combined and confused for many years in European literature. A similar study of North American collections labeled "Sarcodon imbricatus" might be very interesting, since it is reported under spruces, pines, and hardwoods on our continent. Ecology: Mycorrhizal with conifers and, reportedly, hardwoods; growing alone or or gregariously; widely distributed in North America. Cap: 5-25 cm wide; convex to broadly convex with a central depression (the depression is sometimes perforated in age); dry; conspicuously covered with coarse, raised, dark brown to blackish scales; pale to dark brown underneath the scales; the margin inrolled. 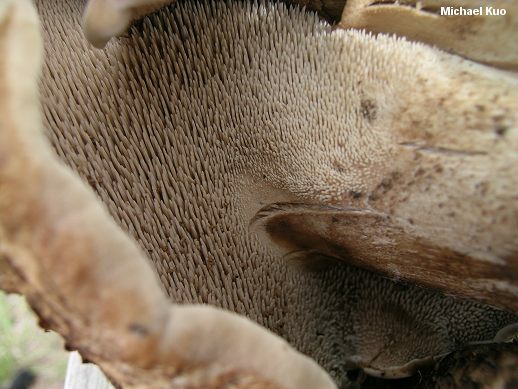 Undersurface: Running down the stem; covered with spines or "teeth" that are .5-1.5 cm long; pale brown at first, becoming darker with age. 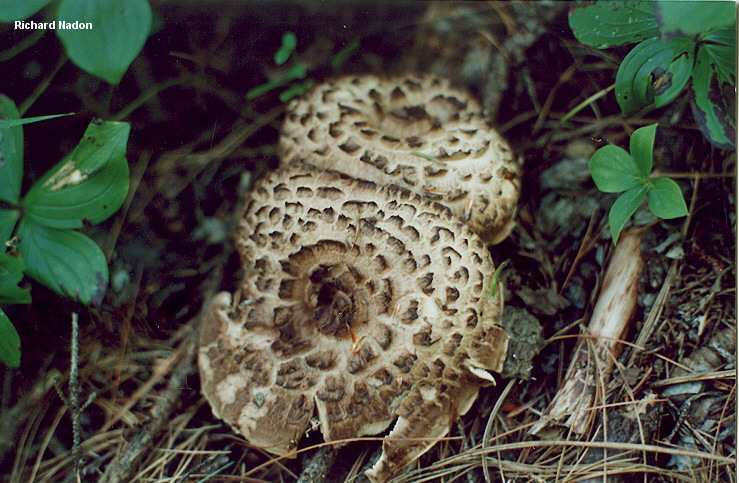 Stem: 4-10 cm long; 1.5-3.5 cm thick; dry; fairly smooth, except where punctuated by aborted spines; pale or brownish; becoming hollow; base with white mycelium. Flesh: Whitish to pale brownish; soft. Odor and Taste: Taste mild or bitter; odor not distinctive. Chemical Reactions: Flesh slightly olive or negative with KOH. 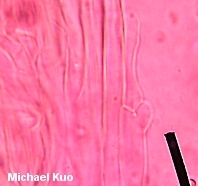 Microscopic Features: Spores 5-8.5 x 5-7.5 µ; irregularly globose; nodulose. Clamp connections present. REFERENCES: (Linnaeus, 1753) Karsten, 1881. (Fries, 1821; Saccardo, 1888; Coker & Beers, 1951; Maas Geesteranus & Nannfeldt, 1969; Smith, Smith & Weber, 1981; Arora, 1986; Baird, 1986a; Baird, 1986b; arrison & Grund, 1987a; States, 1990; Phillips, 1991/2005; Lincoff, 1992; Metzler & Metzler, 1992; Evenson, 1997; Barron, 1999; Johannesson et al., 1999; McNeil, 2006; Miller & Miller, 2006.) Herb. Kuo 08120302, 08150704, 08140808; DBG RMNP 2008-189, 2008-191, 2008-230.